Bleeding-heart (Dicentra sp.) plants are distinctive and striking additions to shady, woodland areas of the yard. They are perennials, so their charm is available year after year. There are several kinds of this sturdy plant, all of which offer interesting foliage and dependable flower displays. The most familiar of the bleeding hearts is called Common Bleeding heart. Appropriately nicknamed "living valentines", this type boasts unique heart-shaped flowers which dangle from thin stems like charms from a bracelet. Common bleeding hearts withstand a fair amount of cold, their range reaching north to the Canadian border and beyond (zones 2,3). As hardy perennials they will grow in regions where lowest winter temperatures dip to -35°F. Size: Common bleeding hearts grow 2 to 3 feet high. Their airy, arching flower stems and branches spread as wide. 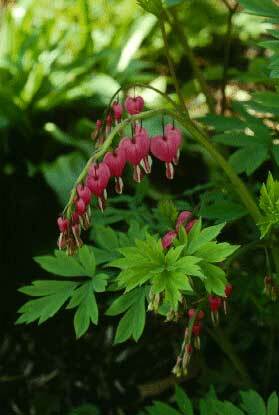 This type of bleeding heart is not a compact plant. 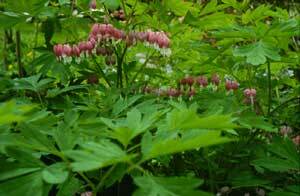 Foliage: The leaves of common bleeding hearts are deeply divided, forming many leaflets on a stem. They are 1 1/2 inches long and are medium to deep green with dark, faintly reddish veins. They often turn yellow or brown after flowering in mid to late summer, especially if the plants are in full sun. At this time they may be cut back to the ground. Flowers: Common bleeding hearts have puffed, heart-shaped flowers. Depending on the variety, they may be pink, rose-red, or white. Eight to a dozen of them are arrayed like lockets along one side of the tops of arching stems. These stems may be anywhere from 2 to 3 feet long. Each of the pendant flowers is about 1 inch long, and they appear in late spring to early summer.